Friends fans have really been through the wringer this month. When it appeared that the 10-season NBC sitcom was meant to leave Netflix in January, the backlash was swift and intense. 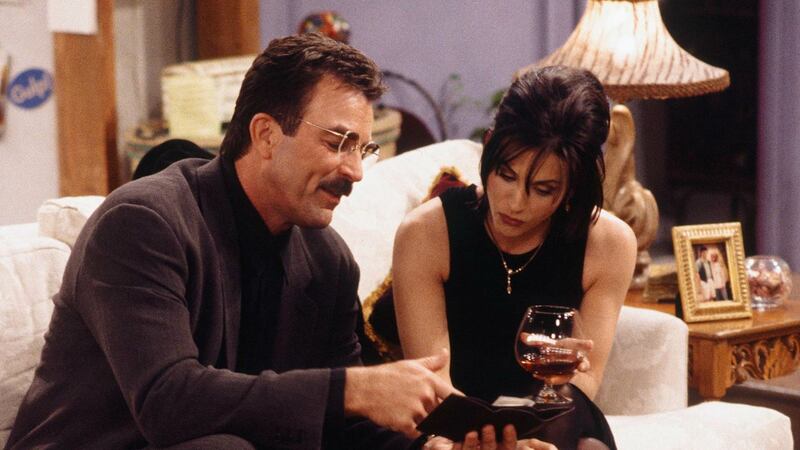 To keep the show on its service for another year, Netflix shelled out $100 million, giving fans the opportunity to keep watching through 2019, meaning they can experience the laughs, heartbreaks and relationships all over again, including the ill-fated romance between Dr. Richard Burke (Tom Selleck) and Monica Geller (Courteney Cox) that defined much of the early seasons of the series. But wait. That’s not all! Fans were also treated to a less-than-official Friends reunion thanks to comedian Claudia Oshry. On Tuesday, Oshry posted a video on Twitter that showed Selleck and Cox running into each other at a New York City restaurant; they hugged and chatted briefly in the clip, which was clearly taken from a nearby table. The tweet soon went viral, raking in nearly 3,000 likes and over 500 retweets this week. “Spotted in NY: Dr. Richard Burke and Monica Geller saying hi to one another,” Oshry wrote. “Shook. What will Chandler say?” Replies featuring some of Chandler’s (Matthew Perry) best insults against the doctor, who was several years older than Monica when they dated, poured in, several of them including GIFs. Unfortunately, this brief and totally unofficial reunion may be the closest we ever get to seeing a Friends revival. Although a fan-made trailer went viral in January, sparking hope among the series’ fan base that a movie or reboot may be in the works, the idea was quickly quashed when the video turned out to be artfully edited clips of the series stars’ projects since the show ended. Stars including Cox, Jennifer Aniston and Lisa Kudrow have all said that they’d be down to do something with the rest of the cast, but they’ve also said a remake isn’t likely.